Last night I hiked to the top of the mountain to get the fantastic shot of the year. Hmm … that didn’t happen. After I got over my self-congratulations at making it to the top (really, it was a hefty hike with my photo backpack & small bottle of water), I casually wondered how I would get off the mountain in the dark. While waiting for the moon to rise, I enjoyed the expanse of the valley of houses below me and the glorious colors as the sun set in the desert. 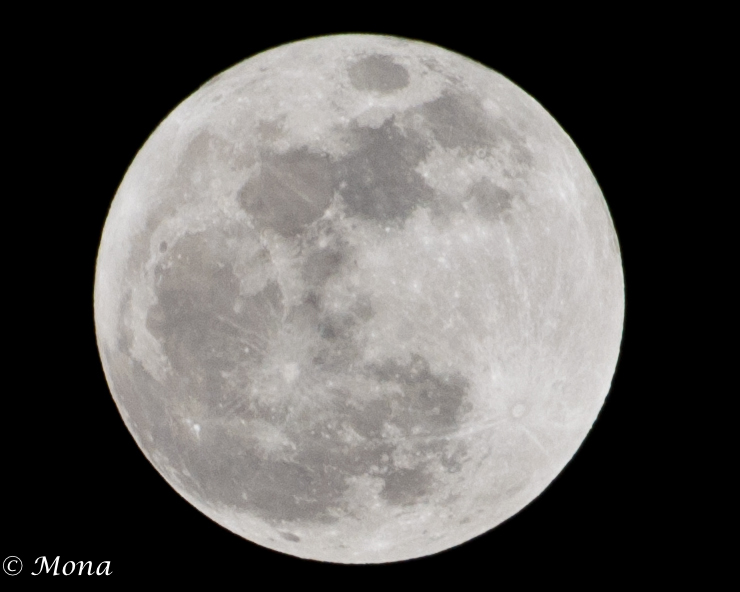 Around 7:10 PM the highly anticipated moon began to rise. On the top of the mountain, I was not able to move my tripod to a position to get the shot I wanted. 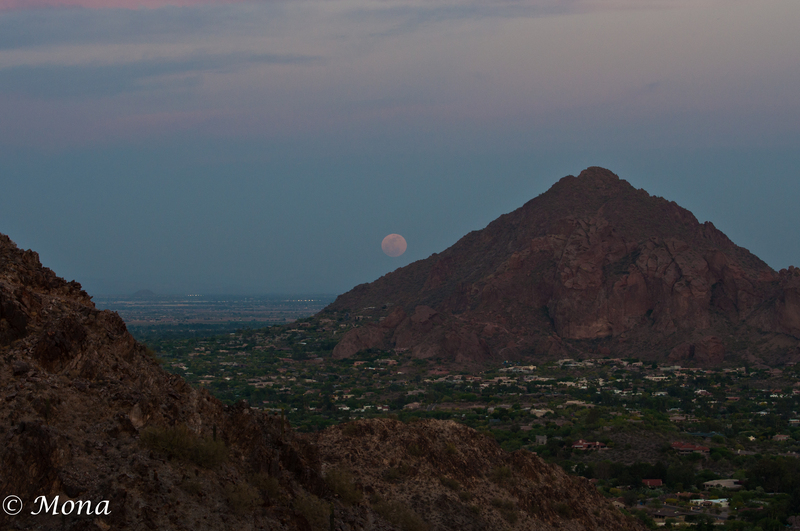 In this shot below, we see the rising moon next to one of the mountains. You can see the homes in the foothills. I wasn’t satisfied and tried to get a closer shot. By this time, I was thinking “Holy Cow, how am I gonna get off this mountain without falling, breaking my leg, hitting my head on a boulder, and lying here all night?” (Actually my language was much more colorful … remember? I teach teenagers who are comfortable emitting gutter language and I have found the trashy words flying out of my mouth.) Just to cover my bases, I had texted my son who can track my cell phone and call out the calvary if needed. With the help of my tiny flashlight that I keep in my photo backpack, I made it safely to the base of the mountain. I waited. I waited. I sat on a lawn chair. I ate an apple. I ate some chocolate. 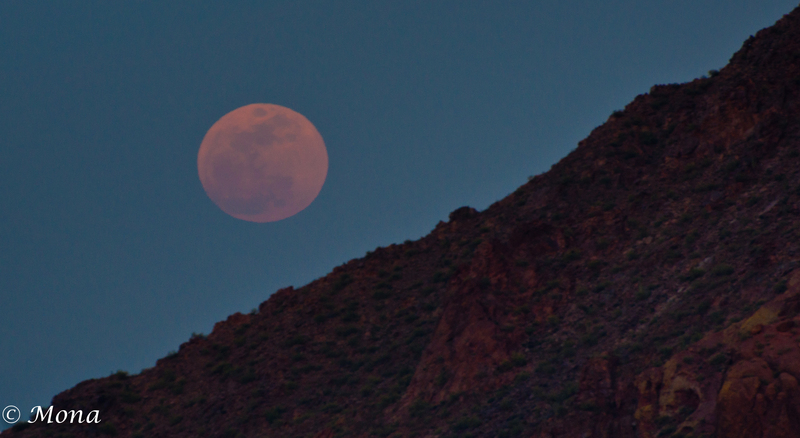 Still that moon did not rise above the mountain … the one I’d just descended. I decided that this was ridiculous, got in my pretend SUV and headed out of the mountain park. As soon as I passed the gate (“Do not back up! 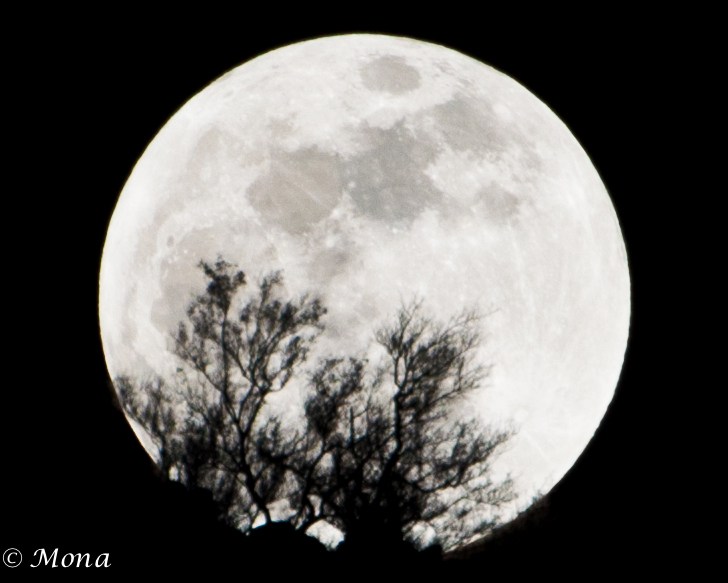 Your tires will be punctured!”) I saw THE MOON peaking around the edge of the mountain. I parked illegally (totally out of character for me) and pulled out the tripod & Nikon. 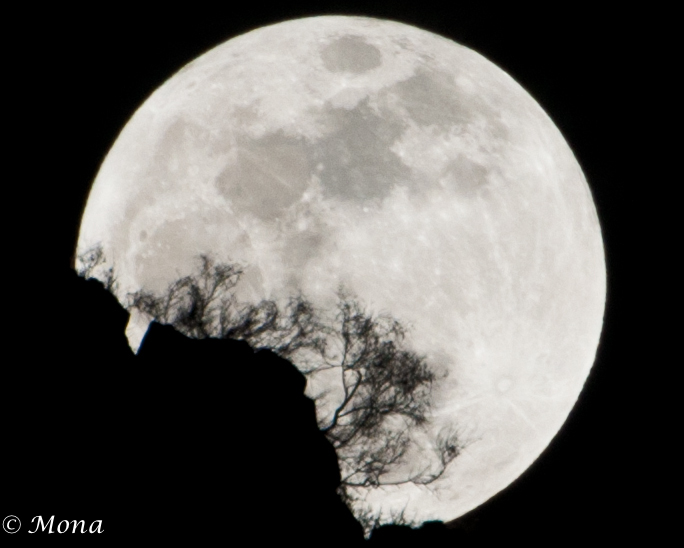 And now you have it: My adventures with the moon on the mountain. But, to my dismay, I did not get that award-winning shot of the orange-tinged moon rising over the horizon. So, to soothe my bruised ego, I finished the night with a juicy hamburger topped with corned beef and swiss cheese, accompanied by a cooling dark beer. Good Night Moon. Well, all I can say is that it doesn’t matter that you didn’t get the orange-tinged moon… as I scrolled down and saw the first picture after you illegally parked, I said out loud, “Oh My God, what a stunning shot”… The next one is even more stunning. Absolutely beautiful, Mona! Really? You LIKE them? Thanks. Actually LOVE them! The second one, with more of the trees in front of the moon, is amazing! Thanks … I enjoyed the time on the mountain and definitely enjoyed the “feast” at the end. It’s super super gorgeous, Mona! I can only imagine the hard work and the energy this would have required. Kudos! Lovely pictures. Thanks for the boost. Thanks for the compliment …. the hard work was enjoyable and relaxing. These are amazing, and what a story that goes with them! I am especially in love with the third shot. Thank you for your kind words & I’m glad that you like that shot. Oh, Mona, you are just such a cool person. Not only are your moon shots beautiful, but so is the story. Maybe, just maybe, we were all in the places we were supposed to be, seeing what we were supposed to see, and getting the photos we were supposed to get. Thanks for sharing YOU with us. Be well and stay blessed. Thank you, Madhu. I had a good time taking them. Wonderful photos. They are pretty much worth the effort. The entire evening was a prize … this was merely the delicious finishing touch to a perfect experience. Thank you! I am glad that you smiled because I’m working on my writing and my intention was to bring out smiles. Also I wanted to say thank for the likes on my posts. I really appreciate it! You are quite welcome … I must check out your moon shots. You did a great job. The shots are beautiful. Thank you … it was a fun solitary experience.